Having a bustling haven of delights like London so nearby is like having a theme park across the road. Dublin has its fair share of noteworthy cafes and restaurants but nothing comes close to the sheer luxury, inventiveness and fun of many destinations in London. In Jen's Weekend: London, a new RTÉ Player series airing every Monday, we get to see the city as the thriving, exciting behemoth it is. After enjoying her Aer Lingus flight, presenter Jen Zamparelli samples the sights and sounds of London, taking afternoon tea on a classic Routemaster bus, nibbling on London's current trendy food and trying out what's been voted the city's best burgers. As Zamparelli galivants around London with Stephanie Pratt in this week’s episode of Jen’s Weekend: London, we chose the most unique, exciting and memorable dining experiences, all only a stone’s throw away. Easily one of the most Instagrammed restaurants in the world, Sketch is even more beguiling in person. 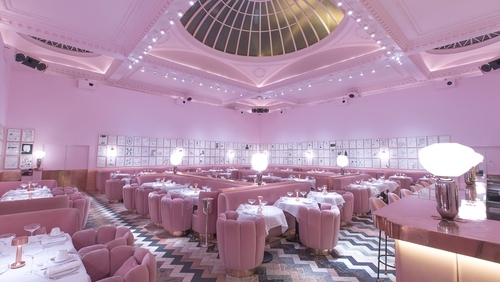 All pink, all the time is the decor ethos, with plump candy-coloured reeded armchairs (like massive charlotte cakes) transporting you to a world Wes Anderson might have designed. The menu is pricey, but this is the top tier of London quirky dining experiences. Afternoon tea is a study in delicacy, with gleaming petits gateaux to go with your bubbly, while dinner is ambitious and daring, including dishes like bone marrow toast and lobster gratin. Don’t do it for your wallet, do it for the ‘gram. A place so nice, they named it Bob twice. An iconic London establishment, Bob Bob Ricard’s brings to mind the luxury that once dominated fine dining in the capital and reminds us that London really was the centre of the universe for at least a few decades here and there. Of course, neither Jen nor Stephanie could resist the call of such opulence and they fit right in. The menu includes traditional Russian fare like chicken kievs alongside reimagined English staples, all updated with contemporary flair and a focus on showcasing standout flavours. Extreme luxury beckons at every turn, from the Orient Express-inspired Blue Dining Room, to the ‘Press for Champagne’ button that adorns each booth. There’s nothing more typically London than afternoon tea, and with plenty of choices dotted across the city you’d be hard pressed finding the best one. B Bakery’s Afternoon Tea Bus Tour is definitely one of the most unique, and even Jen and Stephanie fell victim to its charms. With nibbles like chestnut mushroom quiche and treats like scones with clotted cream and jam, it’s a perfect way to see the city from a new perspective - all from one of their classic red Routemaster buses. For a touch of Gatsby drama and spectacle, take yourself to Circus. Depending on where you’re seated - to the side or front and centre around the quartz ‘stage’ table - you could be inches from a shimmering contortionist atop a giant disco ball. Circus specialises in Pan-Asian cuisine, favouring smaller plates in their Sharing Menu so as to encourage sharing between groups, but for groups of four or less, an a la carte menu is available.Their flavours are just as dynamic, such as roast pumpkin and chive flower spring roll and lychee and aubergine red curry. If you squirm at the mention of yet another eatery offering some kind of food via conveyor belt, you’re not alone. Thankfully, HipChips is not such a place. First of all, there’s no gimmick to it beyond the conveyor belt - just chips and dip. No wonder, then, that Jen and Stephanie had to try it out. They offer a range of sweet chips and luscious dips, as well as savoury ones. Choose from either sweet or savoury chips, or a mix, and a dip or two: cider apples and cinnamon, smokey cheese fondue and campfire s’mores are just some of the options. If your burgers were voted the best in London, you might not be very forthcoming with sharing your secret. Not the case with Mac and Wild. Burgers are the perfect holiday food, so Jen and Stephanie couldn’t resist these guys. Mac and Wild have built their names on showcasing the best in modern Scottish produce, specifically wild venison, beef, steak, seafood, whisky, craft beer and gin. A temporary project that repurposes disused land as a venue for creative, local, independent businesses, this is an unmissable destination. It’s a smorgasbord of culinary marvels, all designed to be accessible and affordable as well as thrilling. Some of the vendors on offer are duck duck goose, serving up contemporary Cantonese dishes; Petare, a family run business serving Venezuelan street food; and the incredibly named 28 Well Hung, specialising in 28 day dry aged on the bone, grass-fed prime beef. Now, who could resist that? Aer Lingus is proud to sponsor the new series Jen’s Weekend: London. Just like Jen, you can enjoy great four star service on your weekend away to London with Aer Lingus. Choose from up to 50 flights departing daily from Dublin, Cork, Knock, Shannon and Belfast. Fares are from €27.99 one way. Smart flies Aer Lingus. Watch Jen’s Weekend now on RTE Player. Chef Adrian Martin: "This is a passion project for me"